Trying to get kids to bed on time can be a difficult feat as they are masters of trying to stay up past their bedtime. Aside from your own sanity, there are plenty of reasons that a good bedtime routine should be an essential part of your day. Sleep is so important to young people that some doctors are putting it on a par with exercise a nutrition. Here are 7 reasons your kid should be getting their vitamin ZZZ. When we sleep, our bodies produce something known as cytokines which are essential for fighting off germs and bugs. If your child is failing to get their 9 hours a night, you might find that they struggle to fight off bugs as well as their friends or classmates. Interestingly, cytokines are also the protein responsible for making us sleepy when we’re sick, so it’s a reminder from our bodies that sleep is essential to staying healthy. Have you ever put your child to bed and been convinced that they’re taller the next day? This is because our growth hormones are activated when we are in deep sleep. So, not only is sleep essential to children, it’s important that they get enough deep sleep from a young age. When children don’t get enough sleep, they can become clumsy and more impulsive. If you’ve ever seen a toddler have a meltdown, you’ll know just how quickly this can turn dangerous if they decide to throw things or hurl themselves on the floor. It’s a common problem that parents face when their baby won’t fall asleep without feeding. In an American study, parents were taught to soothe without feeding from the first two weeks of their child’s life. The study found that the babies were leaner than those who were soothed with food. We carry this right on into childhood, and it was found that children who didn’t get enough sleep had a harder time understanding when they were full, and would overeat as a result. Many children are misdiagnosed with ADHD every year because they aren’t getting enough sleep. While a lack of sleep has been linked to ADHD, the symptoms of a lack of sleep can also mimic those of ADHD, making it difficult to diagnose. If your child is struggling to pay attention or is irritable, they may just need a stricter bedtime routine. Babies might look peaceful when they sleep, but research has found that their brains are very active making sense of what they’ve seen in the day. The tiny twitches you might see are you baby’s brain testing out the nerves and muscle connections. This goes on into childhood when young children process everything they’ve learned during the day while they sleep. A sleep-deprived child may struggle to learn new things and retain information. Children who don’t get enough sleep will often have higher levels of insulin and cortisol in their blood. These hormones are linked to diabetes, obesity and heart disease. Failing to get enough sleep every night means that the heart doesn’t get a chance to fully rest and this can have an impact on the artery walls in the long term. The first step in making sure your child gets enough sleep is to build a strong and non-negotiable bedtime routine. Try to keep your routine to no more than 40 minutes, as it will soon become a stressful ordeal for the parents if it drags on much longer. If your child naturally gravitates towards the bed in their parent’s room, it might be time to upgrade their bed to a luxury mattress, see theluxurybedco.com, so they learn to love being in their own bed. 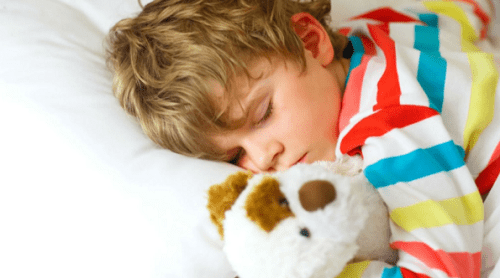 A better sleep routine not only benefits the child, but it’s also a relief for the parents as they will regain precious hours in the evening to unwind and relax. Photo Credit & Infographic Credit: The Luxury Bed Co.